Bring broth, sun-dried tomatoes, and butter to a boil in a medium saucepan. Stir in contents of stuffing mix pouch. Cover saucepan and remove from heat. Let stand 5 minutes. Fluff stuffing with fork. Cool stuffing. Lay steak flat on clean work surface. Sprinkle steak with salt and pepper. Cover steak evenly with stuffing. Roll up steak lengthwise to create a pinwheel effect, enclosing stuffing completely. Skewer seam with toothpicks. Place the steak roll, seam side down, on a foil-covered cookie sheet. Sprinkle roll with salt and pepper. Roast until steak is golden brown and cooked through, about 40 minutes. Serve with Rosemary Mashed Potatoes. Lots of people are commenting on the article from Outdoor Life on SC Gators. See what they've got to say! Click here to see the article, photos of all the big lizards, and check out the comments! 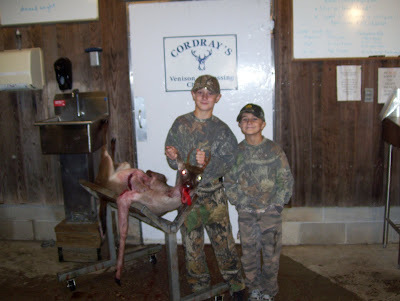 Mills' brothers and their big buck! Matt Mills brought in a big buck! 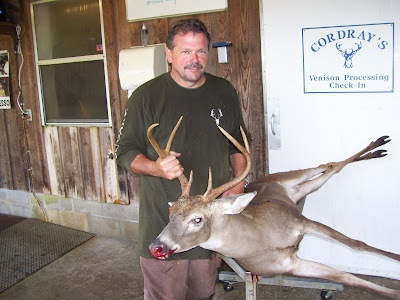 Mike Riley got a 9 point. 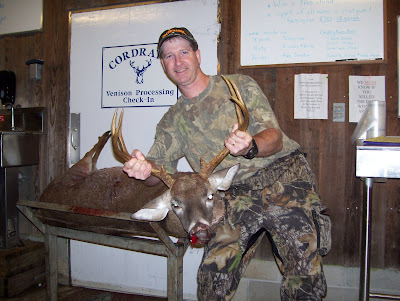 Jack Abercrombie's induction into the Cordray's First Deer Hall of Fame was interesting, to say the least! 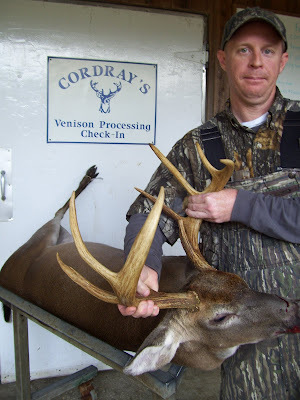 Jeff Becton's buck was 8 points and weighed 123 lbs. 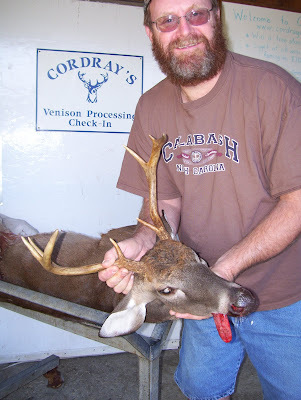 David Mellard got an 8 point buck. Look! We've hit 40,000 hits on this blog! Pretty cool, but the guy from Outdoor Life said they have 1 million hits per month, so we're still just little fish! "Hey, I don't want to tell you how to do something ... but I can tell you that it's much easier if you drag the deer in the other direction. 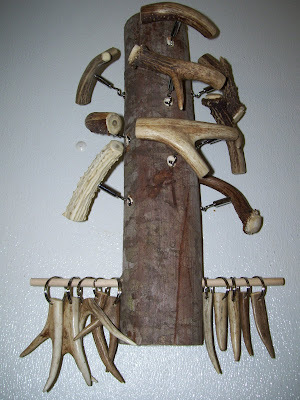 Then the antlers won't dig into the ground." "Yeah, but we're getting farther from the truck," the other added. Bucks moving this morning ahead of the front coming in. Taken in several this am. 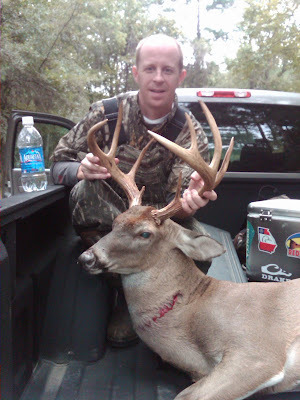 David Glover got this 6 point buck. 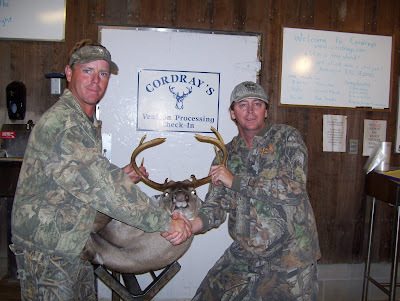 Bryant and Danny Lowery got two bucks together! 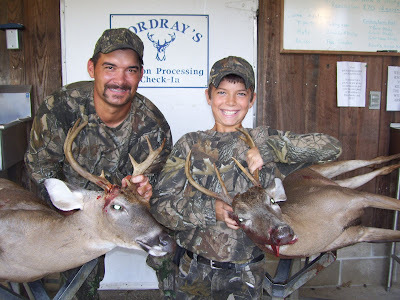 Kenneth's mounting the record of this morning's hunt for this father and son hunting team! 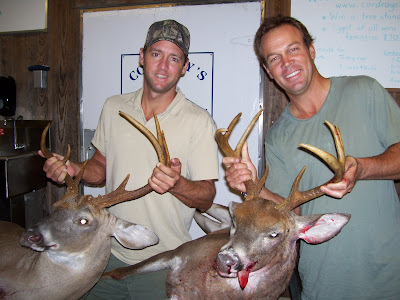 Trey Shepard and Glen Elliott's bucks were 8 points and 7 points. 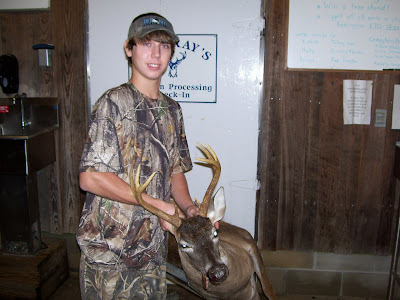 Dawson Williams got a 4 point buck weighing 106 lbs. I told you about all the calls we've been getting as the emails on last year's big gator continue to make the rounds. Yesterday I talked with Outdoor Life magazine and they've got a terrific article featuring gator pics from Cordray's. Check it out! 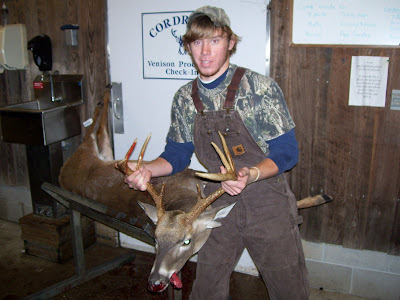 Matt Broome's buck had 9 points and weighed 154 lbs. 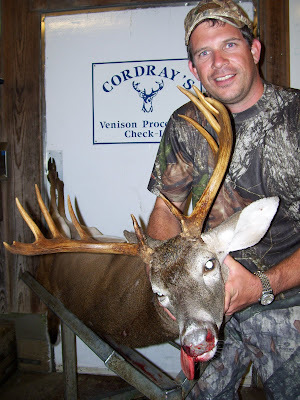 Trad Morrow brought in an 8 point buck that weighed 167 lbs. 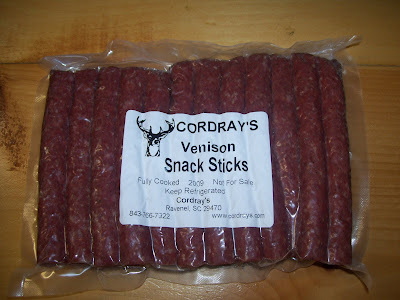 Venison Snack Sticks Come 5 different flavors. This one's plain. 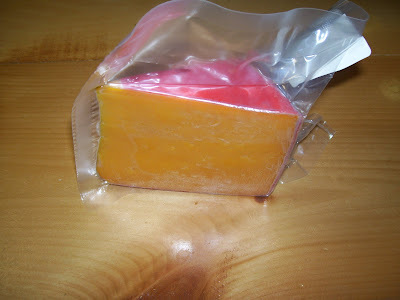 We also have cheddar cheese snack sticks, jalapeno and cheese, swiss cheese, and Monteray Jack snacks! 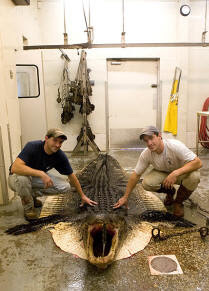 Want to see more pics of the 850 lb alligator from last year? 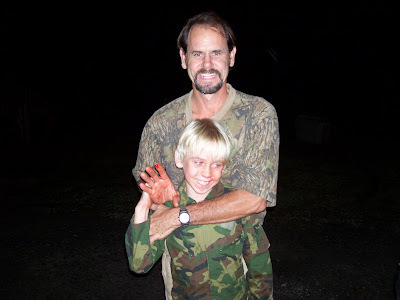 Click on the title link above to see more pictures we took last year of the huge gator taken in Lake Moultrie or use the archive links to the right and look in Sept. 13, 14, and 15, 2008. This week I've had calls from all over including Bill Sharpe from Channel 5 News and someone from Outdoor Life Magazine following up on emails they are receiving. 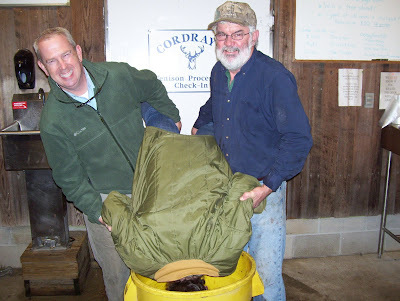 This picture's of Kenneth and Tristan with the hide as it's prepared for a rug mount by Cordray's Taxidermy. This big guy outsized everything we had this year! Lost and Found at Cordray's! Through the years we've found some weird things in the driveway. Lots of tie down straps, several phones, including a Blackberry, wallets, checkbooks, knives, keys, baby booties, a guncase with a rifle inside, a silver wedding band, and shell casings of every description! With most things we've been able to run down the owner. No one ever claimed the wedding band. Today I found this key. 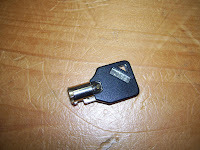 It looks like the kind that locks a computer server, so I thought you might be missing it. Give us a call if it's yours. Chad Atwater got 2! 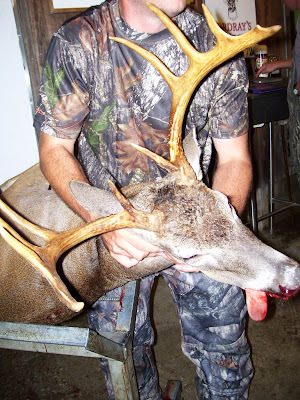 An 8 point buck weighing 160 lbs. 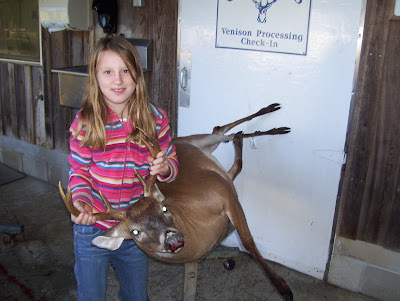 and a doe. Wilson Rogers had a 147 lb. 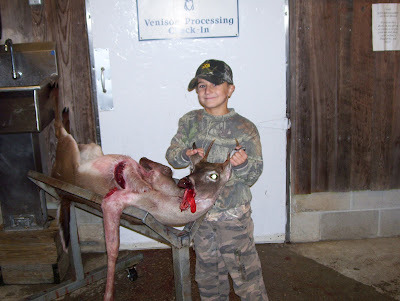 nine point buck. Bailey and Taylor Kuntz were late for school, but for 2 very good reasons! 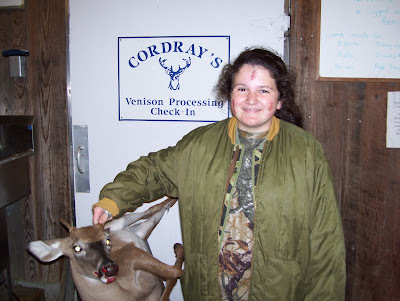 Amy McShane was inducted into the Cordray's First Deer Hall of Fame with help of her dad, Mike McShane! 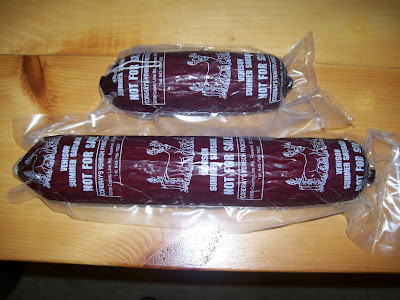 Venison Summer Sausage comes in two sizes. 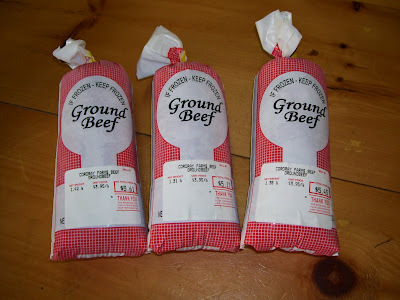 Summer Sausage comes in a large 3 lb. size and a smaller "Gift Stick" size. The gift sticks fit just right in a wine bag. 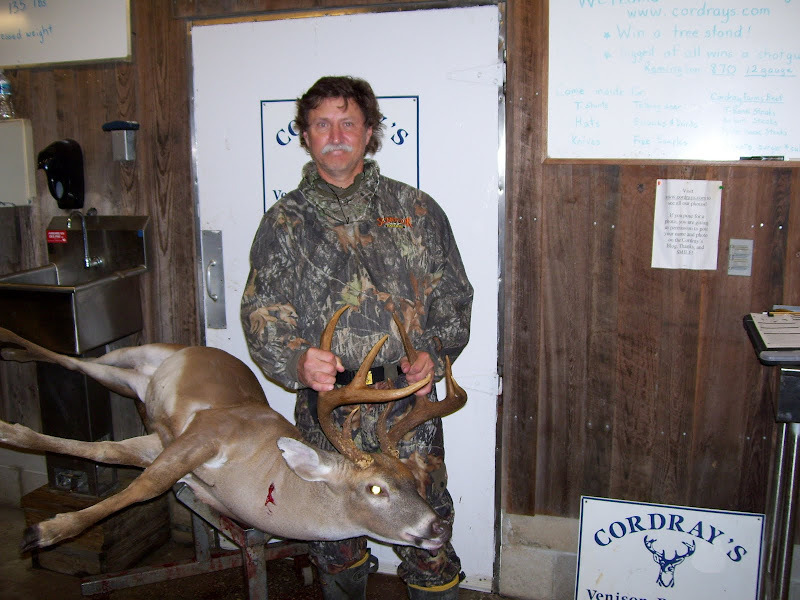 Tim Kulp wins the tree stand for the Big Buck brought to Cordray's from Sept. 28 to Oct .11! 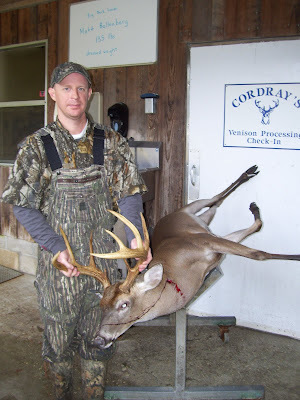 Another look at Tim's Big Buck with a dressed weight of 133 lbs. 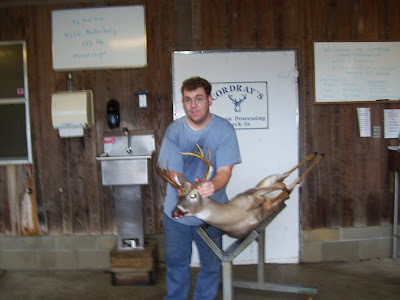 Just one more pound and it would have knocked Matt Bollenberg right off the top of the Big Buck Contest! Come on by, Tim, and we'll get a photo of you picking up the Remington 870 Express Ladder Tree Stand! Do you know Heath Fisk? Well, we've had some discussions here. 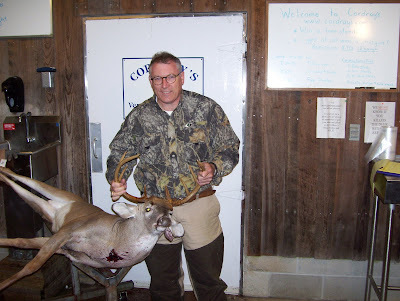 Michael won't let me call 'em Deadbeats or add them to a Wall of Shame or even just publish a list of people who've brought their deer WAY back in August and still haven't come to get it! So let's just put it this way, if you know Heath Fisk, please ask him to stop by and see us today! STAY TUNED FOR MORE MISSING PERSONS! Bucks walking in the middle of the day... We've taken in 7 this morning! 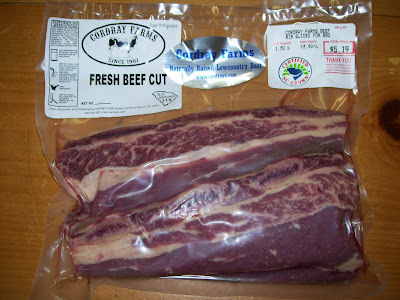 Cordray Farms BBQ Beef Ribs-Delish! And speaking of wild hogs... they are fine to eat, just be careful cleaning them. Rumors have been spreading that it isn't safe to eat the meat of wild hogs. That's just not true! Sows of any size can be processed into smoked hams, roasts, and sausages of several varieties. Boars up to 150 - 200 lbs. often have a very distinctive odor and strong flavor to the meat that makes them a poor choice for processing. The rumors have gotten started from the fact that wild hogs sometimes harbor an infectious disease known as brucellosis that causes flu-like symptoms. Once the animal is cleaned and processed, it is safe to eat. You treat it just like pork from the grocery store and cook it well done, like you do any chicken or pork. 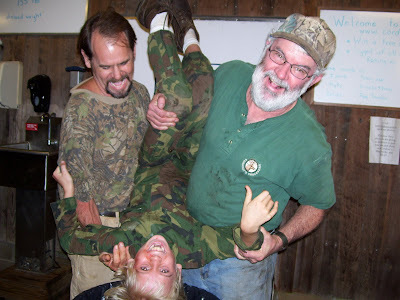 To protect yourselves when you first take the hog, be sure to stay away from the blood or body fluids if you have cuts on your hands and wash your hands well with soap and water after handling pigs. If you clean the hog yourself, do like we do and wear latex gloves and safety goggles. 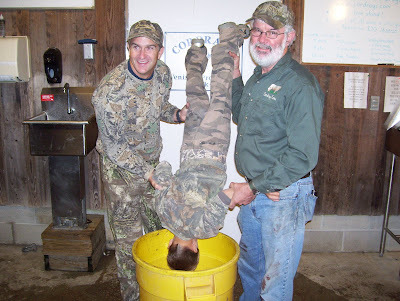 We process hundreds of wild hogs every year and our customers rave about the taste of wild hog hot link sausage! With a little care, you can too! Michael Rama shows off a 251 lb. boar hog! It's WAY too big to process, but it will make an awesome mount! 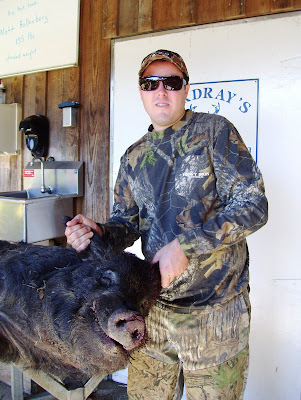 Sows of any size are good to eat, but big boars - 200 + lbs - make good mounts, but lousy sausage! Kim Matthews started off the morning with a 7 point. 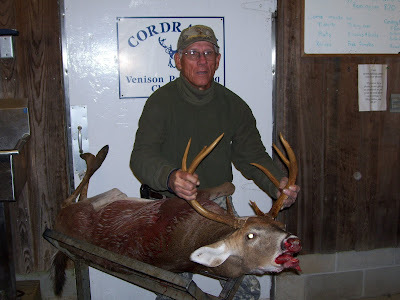 Doug Sass had a 9 point that weighed 148 lbs. Jason Edgerton and David Harrison came all the way from Hemingway with another one! 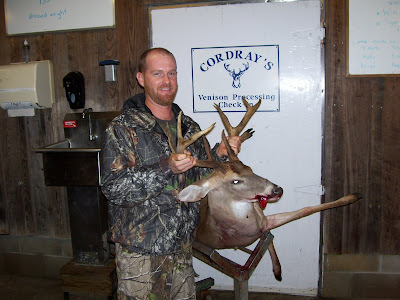 Jason Edgerton got this big buck with 8 points and 173 lbs. 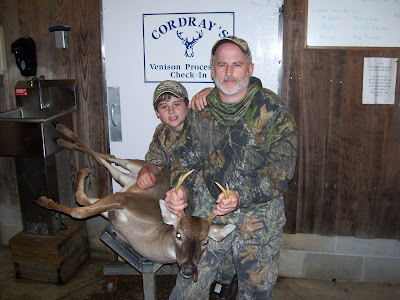 We had 7 FIRST DEER on Sunday night! 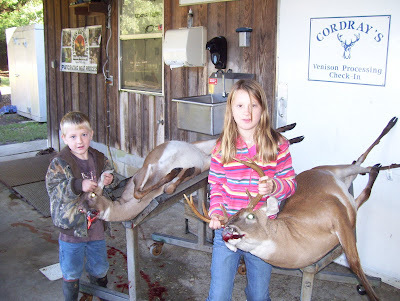 These folks all got inducted into the Cordray's First Deer Hall of Fame. 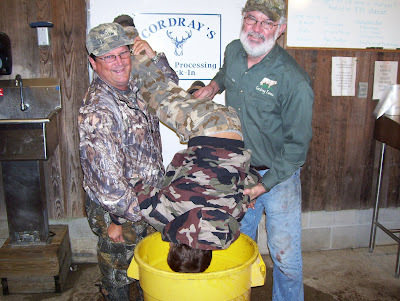 They got dunked in the gut barrel, had a facial, and received a Free Cordray's hat or T-shirt. Congratulations to all! 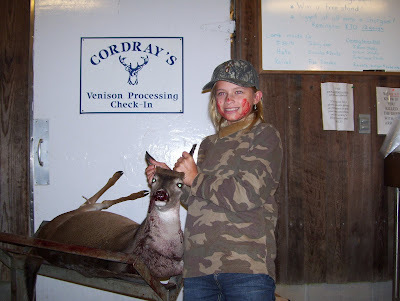 Brooke Aden joined the Cordray's First Deer Hall of Fame! 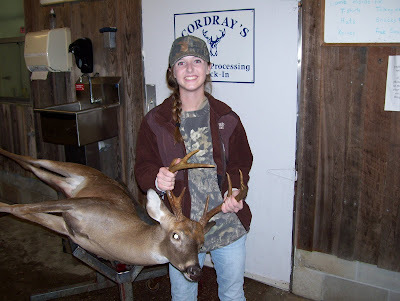 Lindsay Destefano's first deer was an 8 point! A Familiy Favorite - Meatloaf! 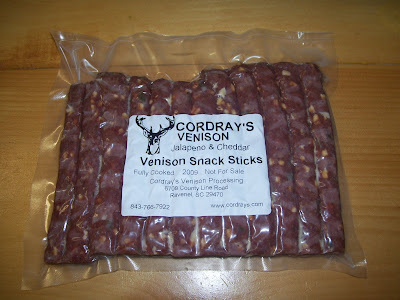 Introduced in 2004, Cordray's venison meatloaf is a delicious and easy way to add variety to your venison cooking. It's also another great way to make use of your ground meat without ending up with a freezer full of burger! 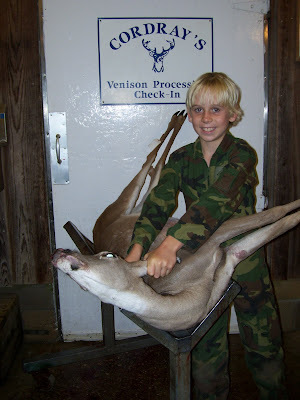 Your venison is ground fine, seasoned perfectly to be ready to bake, and packaged in two pound loaves. At just $4 a loaf, you certainly can't beat that for a hearty main course for your family -- and you might even have enough for leftovers! For the quickest recipe, just thaw, place in a baking pan and bake at 350 for an hour and a half. If you're looking for a little more excitement, you can dress it up with a coating of ketchup or tomato sauce before baking. Scoop out the middle of the venison loaf, fill the hole with shredded cheddar cheese, then replace the meat you scooped out and bake as usual. Separate the loaf into balls, cover with your favorite tomato-based sauce, and bake. Makes delicious meatball sandwiches! 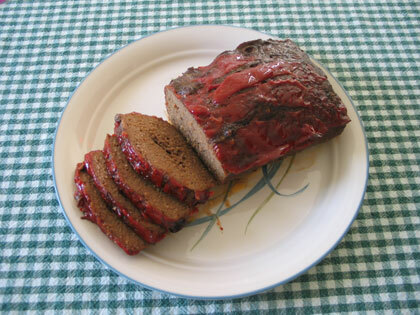 Order a few loaves and let us know if you come up with any other great recipe ideas for venison meatloaf here. 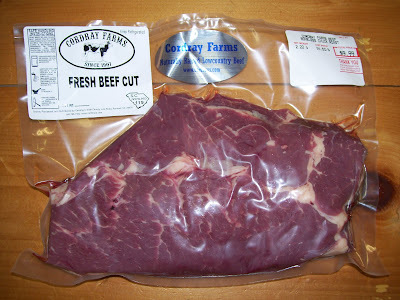 We also have Cordray Farms Beef Meatloaf in stock, same delicious recipe! 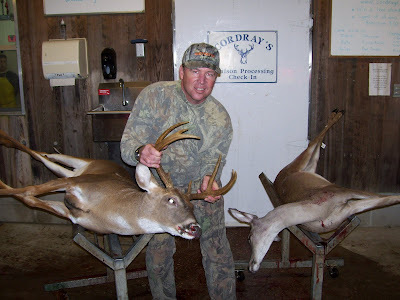 Steve Joy had an 8 point! 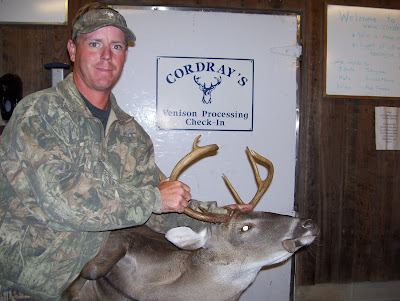 Brandon Foster's first buck was a cowhorn at 97 lbs. 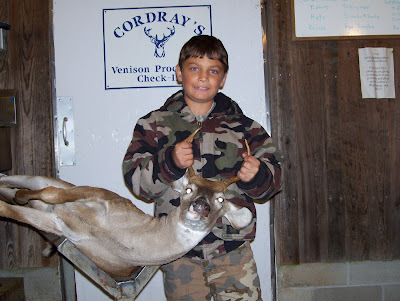 Will Brabham's first deer was a 3 point.